Image: Light colored text reads: “Nearly two-thirds of children with autism have been bullied.” -from Autism Speaks website When the biggest autism advocacy organizations are still using the rhetoric of hate and fear in regards to our lives, is this shocking? Autism Speaks, you are supposed to be on our side, but you work against us. You call us burdens and talk about how much we cost to society. If that’s not bullying, I don’t know what is. Text is on multicolored faded vertical stripes. Apparently, Autism Speaks is celebrating ten years of speaking for Autistics while actively silencing and stigmatizing us. Recently, they posted a list of things they have accomplished in the last ten years on their website. As you might expect, it was extremely problematic, disrespectful, inaccurate, even full of some outright lies, and most importantly and predictably, without the input or wisdom of any Autistic people. Here, I do my best to pick apart what they have said and offer my own suggestions and input. Autism Speaks speaks for us, and my response follows. “1. Autism’s prevalence has skyrocketed. More informed professionals are better able to identify Autistic people than in the past. Autistic people have always been here, but with different labels, institutionalized, segregated from society or living their lives without appropriate supports. “2. Direct screening suggests that autism’s prevalence may be even higher. The Korean study was based on parent reports. Only 63% of parents out of 55,000 responded to the survey. Researchers also pointed out that parents of Autistic children were more likely to fill out the survey. In addition to that, the survey identified Autistic characteristics in children. Those children may or may not fit the criteria for an autism diagnosis. Do you even know what autism is? “3. Autism can be reliably diagnosed by age two. Autism Speaks needs to stop perpetuating the myth of a “developmental window” and pushing parents to put their toddlers into therapies that are the equivalent of a full time job. We do need more resources and supports in under-served and marginalized communities. Autism Speaks could do that if they were more responsible with their budget. They need to prioritize the needs of individuals and families instead of trying to cure or fix what is not broken. So, where is the money going? How much is spent in our communities, especially our most vulnerable and marginalized communities versus how much is spent investing in “research” that is basically eugenics? “4. High-quality early intervention does more than develop skills. You can’t change my neurology. I am Autistic and training us to “act normal” does not work. Listen to Autistic people instead of trying to speak for us and fix us! Stop talking about how much we “cost” for needing support. I need a lot of support, as do many of my Autistic peers. Some days I need more support than others, but my life is always worth living. Being Autistic is not a problem, but ableism and the fact that the biggest autism advocacy organization consistently refers to us as burdens and drains on society, sure as hell is a problem! “5. Behavioral therapy for autism can transform lives. Behavior is communication. Stop trying to force us into “behavioral therapies” that deny our dignity, autonomy and humanity. ABA and compliance based therapy is NOT the answer. Love, acceptance and respect for ALL human diversity is. “6.One third of children and adults with autism are nonverbal. Some of the best people I know are non-speaking. 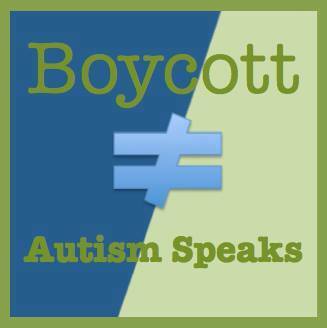 I don’t understand why ⅓ of all Autistic people being non speaking is a problem for you, Autism Speaks. Because it is not. Lack of support and resources, that is the problem. You can do more, Autism Speaks. You can stop trying to fix Autistics, start respecting that all communication is valid, and start supporting more non speaking Autistics with access to AAC instead of spending millions to try to prevent us from being born. How many more Autistic people could you help if your focus was on support instead of prevention? “7. Assistive communication devices encourage speech in some nonverbal children. Autism Speaks needs to recognize that ALL communication is valid. Autistics who do not speak, who have difficulty at times with verbal speech, or who prefer to communicate in non traditional ways need to be supported, not forced to talk. For many Autistic people, spoken language is difficult and uses too many of our resources. Put the focus on respecting and supporting all forms of communication, not on talking. “8. Autism-related GI disorders are real. Research by the Autism Speaks ATN revealed that half of children with autism have GI disorders and the pain can worsen behavioral symptoms. The Autism Speaks Autism Treatment Network has developed effective treatment guidelines for pediatricians and tool kits for parents. 9. Autism-related sleep disturbance is common and treatable. Thanks to research funded by Autism Speaks, we now have evidence-based medical guidelines and tool kits to help parents improve the sleep of those with autism. 10. As many as one third of individuals with autism have epilepsy. The potentially dangerous seizures are not always obvious without specialized testing. 11. Autism can affect the whole body. 8-11. Co-occuring conditions are NOT Autism. Yes, it is important to address and acknowledge the medical needs of Autistic people, but do not confuse separate diagnoses with autism. “12. Whole genome sequencing can guide personalized treatment. As Autistic people have stated many times, we are NOT MISSING! From the name of the program to the eugenicist implications of this research, you are not helping Autistic people. In fact, you are ignoring the very real needs of Autistics right now in a quest to prevent more of us from ever being born. “13. Environmental factors can play a significant role. “14. We’ve begun to identify autism’s environmental risk factors. Autism is a natural part of human diversity. “Reducing the risk” means what exactly? Preventing more Autistic people from being born? The “links” between folic acid and exposure to air pollution are not proven. They are hypothesized by various studies, but not proven. 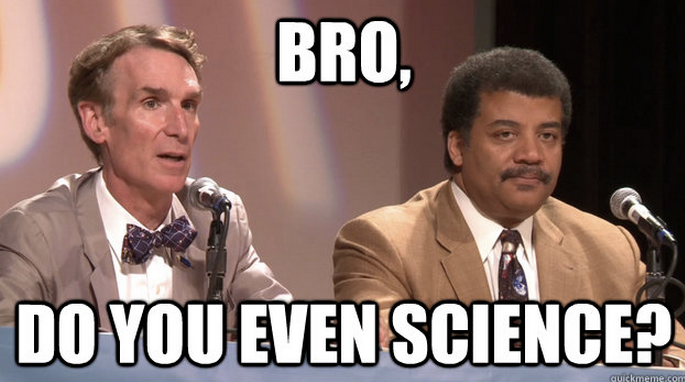 Image: White text outlined in black reads “Bro, do you even science?” Text is on photograph of Bill Nye and Neil deGrasse Tyson who both look incredibly annoyed as they sit in front of two microphones at a table. “15. Nearly half of those with autism wander or bolt. Typically developing children also wander and bolt. Resources should be focused on accepting all communication, and giving Autistic children access to AAC and the ability to develop self-advocacy skills instead of just being trained in compliance. Many times Autistic children wander and bolt to avoid situations that are overwhelming or hostile. First responder training, while seemingly a worthwhile goal RARELY works. If it did, Disabled people would not be disproportionately affected by police violence. Teaching water safety is definitely something that could benefit Autistic children. Autism Speaks, can you invest some of the money you are using to prevent people like me from being born and put it back into our communities so that more Autistic children will be safe now? “16. 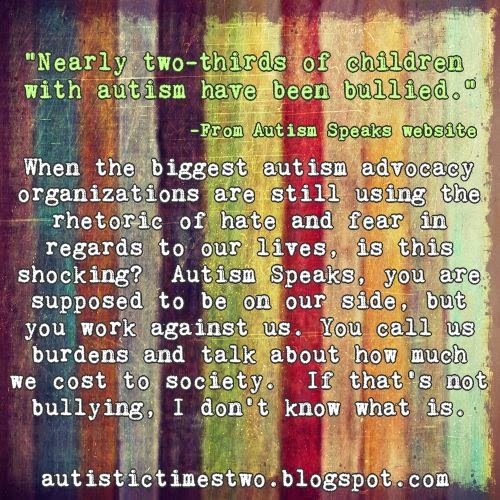 Nearly two-thirds of children with autism have been bullied. When the biggest autism advocacy organizations are still using the rhetoric of hate and fear in regards to our lives, is this shocking? Autism Speaks, you are supposed to be on our side, but you work against us. You call us burdens and talk about how much we cost to society. If that’s not bullying, I don’t know what is. “17. Most adults with autism (84%) remain living with their parents. Autism Speaks is advocating for federal and state policies that will increase community living options for adults with autism. 18. Nearly half of 25-year-olds with autism have never held a paying job. Autism Speaks is working to increase vocational and post-secondary educational support for young adults with autism, and is working with employers to expand job opportunities. 19. Each year, an estimated 50,000 teens with autism age out of school-based autism services. 17-19. How are you doing this? What programs are you developing to put in place to help us? Are they led by Autistic people? Are the things we want considered or are you talking about us, without us again? “20. The cost of autism across a lifetime averages $1.4 million to $2.4 million. We are more than burdens on our families and society. You talk about Autistic people in such disrespectful and dehumanizing ways. Your hateful rhetoric has real world consequences. So much that The Autistic Self Advocacy Network has had to create an anti-filicide toolkit in the hopes of preventing more of our parents and caregivers from killing us! When you call us burdens, and reduce us to a dollar amount, tell us that we cost society too much money for existing, there is blood on your hands, Autism Speaks. People are listening to you, and what you have done with that great responsibility is to devalue our lives and tell the rest of the world that we don’t deserve to be in it as we are. You have the power and the resources to change the way the world sees Autistic people. We, along with our families are asking you to take that power and make the world a better, fairer, more accessible and friendly place for Autistic people. Stop punishing us just for existing. We are more than an inconvenience to you. Autism Speaks, the time for you to shut up and listen to Autistic people is long overdue.